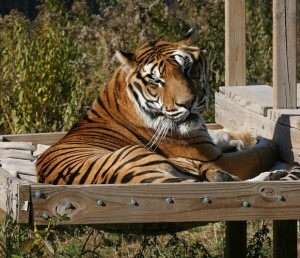 Home » Won’t You Help Feed a Feline Today at The Wildcat Sanctuary? Feeding big cats is a big job. Tonka the tiger is the largest cat at the Sanctuary. He was a former exhibit cat living in a small, non-compliant enclosure prior to arriving at The Wildcat Sanctuary. Thanks to you, Tonka now has room to roam. His natural enclosure provides tall grasses for stalking, a hammock to lounge on and a pool to play in. With so much to do… cats like Tonka work up quite an appetite. As the adage goes, “You are what you eat.” Selecting the right diet is especially important for cats because of the unique way they break down food for energy. So the simplest and most critical thing we can do to help rescued cats like Tonka is to provide them with nutritious food. Many people assume that all the food at the Sanctuary is donated, but that’s not the case. We have to purchase assorted meats every week for the wild cats. This nutrition costs $120 a month or $1,440 per year – just to feed ONE big cat at the Sanctuary! Meal time is a happy time at The Wildcat Sanctuary. Tonka trots up to his room and waits patiently for his food. He’s a very gentle tiger, though he’s a giant one, for sure! We know you’re always giving toward our lifesaving work and for that, we’re forever grateful. Will you also spread the word to your friends and family, through Facebook, and word of mouth, to help us meet our goal for Tonka and the other cats? Your gift of $120 will help feed one big cat for a month, or $40 will feed a small cat. No one can do everything, but everyone can do something. Because of YOU, big cats like Tonka have had a second chance at life and now live wild at heart. You can donate any amount to the Food Fund, including helping purchase turkeys for the cats’ upcoming holiday meals, too! 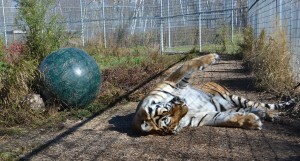 The Wildcat Sanctuary (TWS) is a 501c3 non-profit, no-kill big cat rescue facility located in Sandstone, MN. TWS provides a natural sanctuary to wild cats in need and inspires change to end the captive wildlife crisis. We do not buy, breed or exhibit animals. TWS is funded solely by private donations and receives no state or federal funding. TWS is accredited by the American Sanctuary Association and the Global Federation of Animal Sanctuaries. The Sanctuary is a home for animals, not a zoo for people and is not open to the public. Combining natural and spacious habitats with a life free of exhibition or exploitation, the Sanctuary allows all residents to live wild at heart. Any donations received above the amount of the food program will go towards the daily care of the residents and sanctuary operations.